Mergers & Acquisition in Malaysia: A Comprehensive Step-by-Step Approach is the perfect companion for businesses and professionals who require a better understanding of the M&A process in Malaysia. It is also a handy book for entry level legal practitioners who require an easy to understand guide to the business aspects of M&A. Mergers & Acquisition in Malaysia: A Comprehensive Step Step-by-Step Approach gives us an overview of the regulatory framework governing Mergers and Acquisitions in Malaysia. 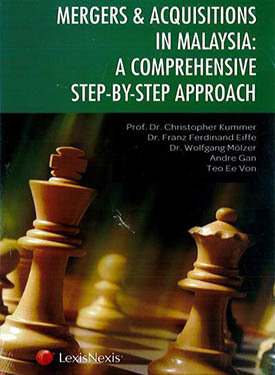 It summarizes the most accurate and understandable strategies, analytical tools and measures on corporate acquisitions and disposals including the planning, organization and implementation works; synergies, integration and post-acquisition management controlling; processes and challenges in business valuation; and corporate sales and auctions.